Khaman recipe – This is the popular Gujarati delicacy made from gram flour. 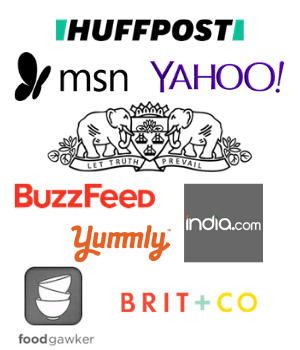 Today I am sharing Instant version of it which can be ready in only 20 minutes. 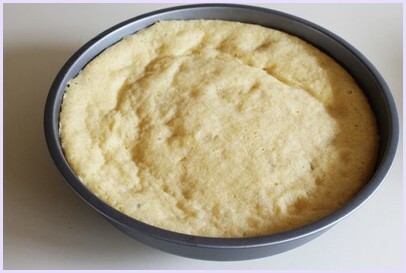 Traditionally the batter is prepared before 10-12 hours or overnight and kept it for fermentation. Since this is quick method, we will be using eno fruit salt. This is really soft, spongy, porous, fluffy and smooth in texture like nylon. Hence it is also known as Nylon khaman recipe. It has combination of slightly sweet, tangy and spicy taste and flavors. 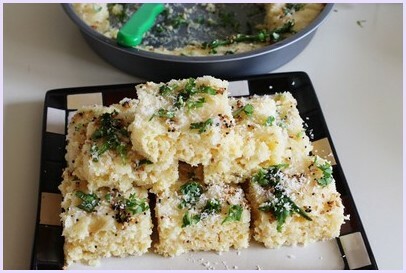 Many people refer this snack as khama dhokla recipe. But that is not correct. 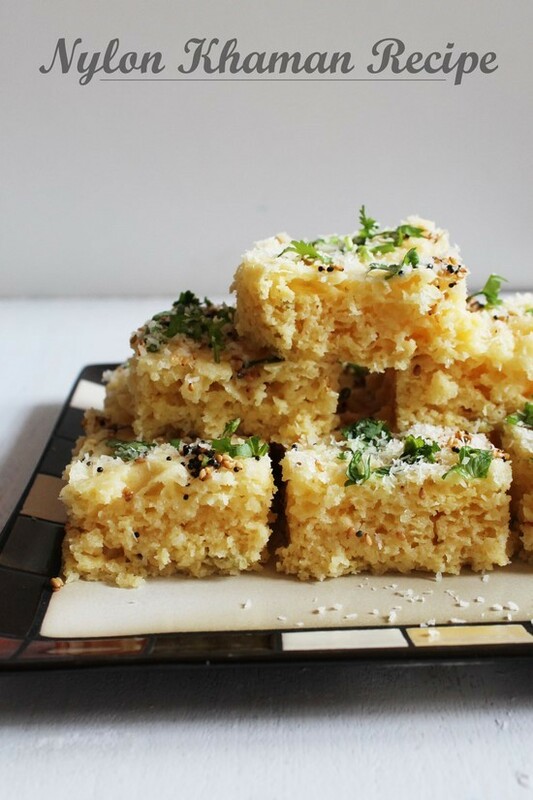 Khaman and dhokla are two different dishes. 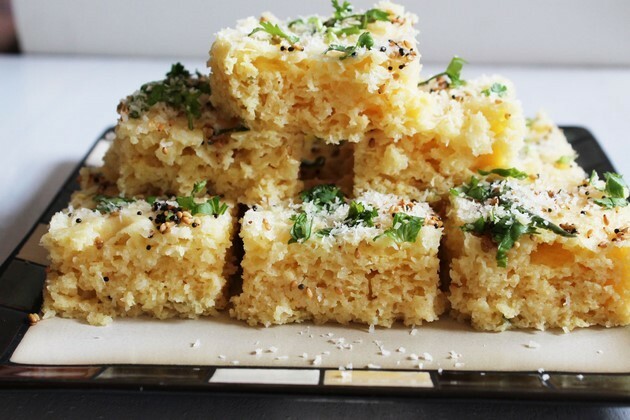 There is no such dish combined khaman dhokla. 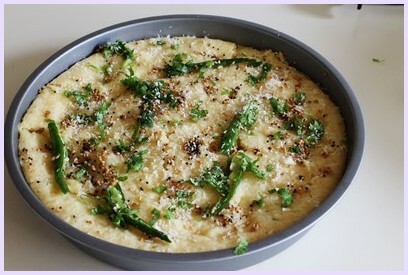 Dhokla are less spongy and fluffy compared to this one. There are many different varieties of khaman e.g. vati dal na khaman, amiri khaman, sev khamani, masala khaman and so on. 1) First grease a thali or plate using little oil. Bring water to a boil in the steamer. While it is getting ready prepare the batter. 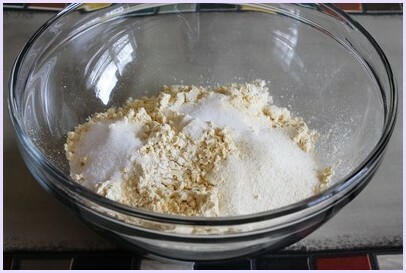 2) Take dry ingredients (besan, sooji, salt, citric acid) in a bowl and mix. 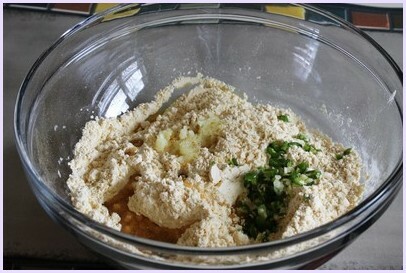 3) Add grated ginger, green chilies and oil. Again mix properly. 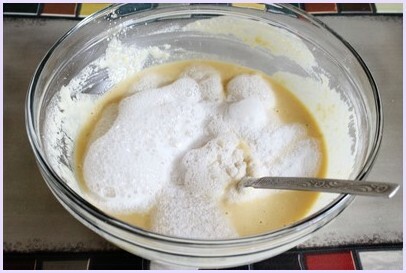 4) Now make lump free batter by adding little water at a time. 5) Sprinkle fruit salt on the batter and then few drops of water on it. it will start to bubble up. 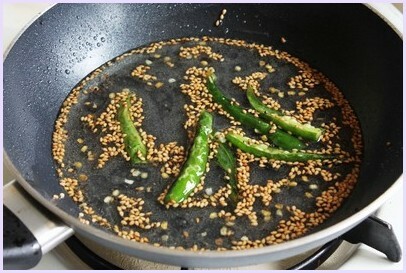 6) Immediately stir it, BE QUICK and pour into prepared thali or pan. Steam it for 13-15 minutes on medium heat. 8) While khaman are steaming, make tadka. Heat the oil in a small pan on medium heat. Once hot add mustard seeds, let them pop. Add sesame seeds, let them splutter. 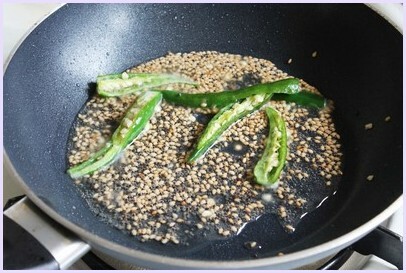 9) Then fry green chilies in it for a minute. Turn off the heat and let it cool for a minute or two. 10) Then pour 1/2 cup of water in the tadka and add sugar. Stir it till sugar dissolves. 11) Now check the khaman by inserting a knife or toothpick. If it comes out clean then it is ready. Remove it from the steamer. 12) After a minute or two, cut them up into squares. 13) Pour that tempered water evenly on to fluffy khaman. It will soak all the water and will become moist and flavorful. 14) Finally garnish with coconut and chopped cilantro. 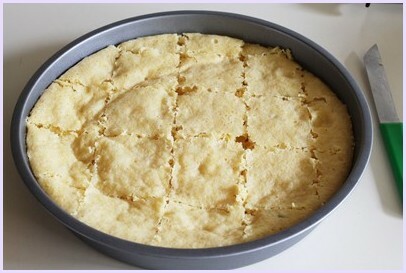 15) Remove the square pieces into a serving plate and enjoy. Serving suggestion: This can be served as a snack with cup of hot tea or as such. This is usually served as a farsaan (side accompaniment) along with your meal. Always steam them on medium heat. As soon as eno bubbles up, do things quickly. Immediately pour into pan and steam. It will come out dry if your besan is old. If it happens, add more water in tempering. Use spoon to pour tadka on top, so your can pour on all the surface evenly, and so every piece of khaman get chance to absorb water and thus it will become moist. First grease a thali using little oil. 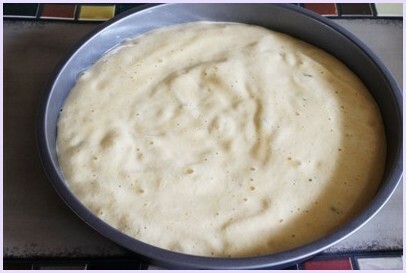 I have used 9 inch round cake pan. Make sure that your pan or thali has sides with 1 1/2 inch height. Bring water to a boil in the steamer. While it is getting ready prepare the batter. Take besan, sooji, salt and citric acid in a bowl and mix. Add ginger paste, green chilies and oil. Again mix properly. 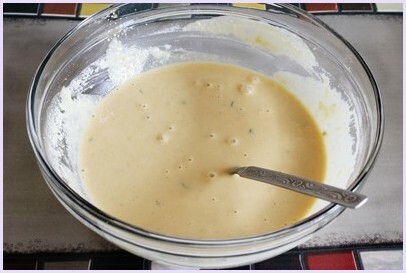 Now make lump free batter by adding little water at a time. Sprinkle fruit salt on the batter. Sprinkle few drops of water on it and it will start to bubble up. Immediately stir the batter and pour into prepared thali or pan. Steam it for 13-15 minutes on medium heat. check the khaman by inserting a knife or toothpick. If it comes out clean then it is ready. Remove it from the steamer. After a minute or two, cut them up into squares. Heat the oil in a small pan on medium heat. Once hot add mustard seeds, let them pop. 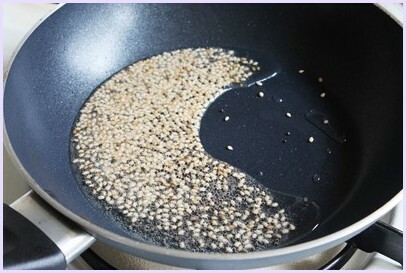 Add sesame seeds, let them splutter. Then throw in some green chilies, fry for a minute. Turn off the heat and let it cool for a minute or two. Then pour 1/2 cup of water in the tadka and add sugar. Stir it till sugar dissolves. Pour that tempered water evenly on to fluffy khaman. It will soak all the water and will become moist and flavorful. Finally garnish with coconut and chopped cilantro. I have tried kaman before using other recipes in the internet. But your recipe is very perfect, it has addressed all the issues i had in the past. Thanks for the recipe. We were able to enjoy this kaman because of your exact measurements. Thanks. Happy to know that khaman came out good and you got success. I have a question, can this be prepared on the previous day and served the next day for guests. I thought I will ask you if there are any reheating options. yes this can be prepared a day before. it tastes good without reheating. but if you want, you can just warm up in microwave. heating more than warm (or overheating) will make them dry.